Try our Satisfaction Guarantee - compare our prices and our superior quality! This 3 inch diameter sphere of natural quartz crystal is mostly transparent with some slightly more cloudy areas. This quartz crystal ball was sawn and polished from a natural quartz crystal that was mined in Minas Gerais, Brazil. This 2.8 inch diameter sphere of natural smoky quartz crystal has very good transparency with some large facet grade areas inside. This smoky quartz crystal ball has very rich golden-brown natural color (natural smoky-citrine color). It was sawn and polished from a natural elestial smoky citrine crystal that was discovered in a pegmatite in Minas Gerais, Brazil. This 3.3 inch diameter sphere of natural quartz crystal is mostly transparent with some slightly more cloudy areas. This quartz crystal ball was sawn and polished from a natural elestial quartz crystal that was mined in Minas Gerais, Brazil. This 5.1 inch diameter sphere of natural quartz crystal has very good transparency with some veils and planes inside along with some rainbow reflections. This colorless quartz crystal ball was sawn and polished from a natural elestial quartz crystal that was found by local miners in Minas Gerais, Brazil. There are some tiny bright red iron oxide inclusions in one small area inside this beautiful and unique sphere, and there also is a 2.5mm gas bubble trapped inside a fluid inclusion (also known as an "enhydro" or as a "2-phase inclusion"). See another view of this genuine elestial quartz crystal ball. See a side view of this genuine quartz crystal ball. See also an opposite side view of this wonderful elestial quartz crystal ball. This 4 inch diameter sphere of natural elestial quartz crystal has light brown natural color with a darker brown smoky quartz phantom in one area. When placed in just the right position, this medium-dark brown smoky phantom shape is visible - see a view showing the smoky phantom in this genuine elestial quartz crystal ball. This natural color elestial quartz sphere has good transparency with several very colorful internal rainbow reflections inside! See another view showing more of the beautiful rainbow color reflections in this genuine elestial quartz sphere. This unique sphere also looks great on a light box. This elestial quartz crystal ball was sawn and polished from a natural elestial quartz crystal that was mined in Minas Gerais, Brazil. This 4.2 inch diameter sphere of natural elestial quartz crystal has medium brown natural color with veils, planes and rainbow reflections inside. This genuine elestial quartz sphere has just enough transparency that you can very faintly see all the way through the sphere. This unique sphere looks beautiful on a light box! See also a back-lit photo of this genuine elestial quartz sphere. This 5.6 inch diameter sphere of natural elestial quartz crystal has very rich medium-dark brown natural color. The photo at left is front lit. This genuine elestial quartz sphere has just enough transparency that you can faintly see all the way through the sphere when back-lit. 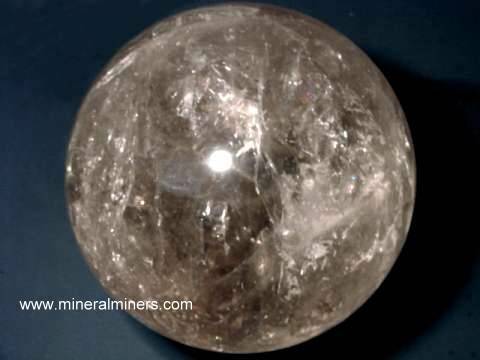 See a back-lit photo of this genuine elestial smoky quartz sphere. This unique sphere looks very nice on a light box! See another back-lit photo of this natural color smoky quartz sphere. 37.5 pound Elestial Quartz Crystal Sphere! This 9.1 inch diameter sphere of natural elestial quartz crystal weighs 37.5 pounds! You can see into this genuine elestial quartz crystal ball's interior from a minimum of about 3 inch deep up to about 5 inches deep maximum visibility. There are many planes and veils within this giant crystal ball, and there also are several rainbow reflections inside it. This elestial quartz crystal sphere also has a few small orange-red hematite inclusions as shown at left. This amazing elestial quartz crystal ball looks wonderful on a light box! See also a back view photo of this quartz crystal ball. 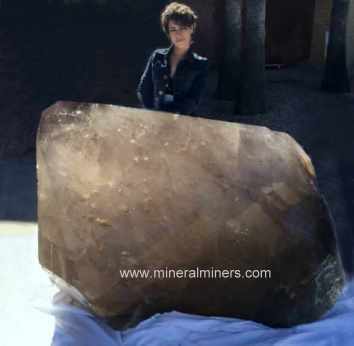 We are offering this large decorator sphere of natural elestial quartz crystal (rock crystal) at a special offer below wholesale discounted price of $200/kg = $3410. 6" tall x 3.7" wide x 2.7"
This beautiful elestial crystal has pale golden natural color as shown (natural color light citrine). It was polished from a natural elestial quartz crystal mined in Minas Gerais, Brazil. It is transparent with some beautiful internal rainbow reflections. 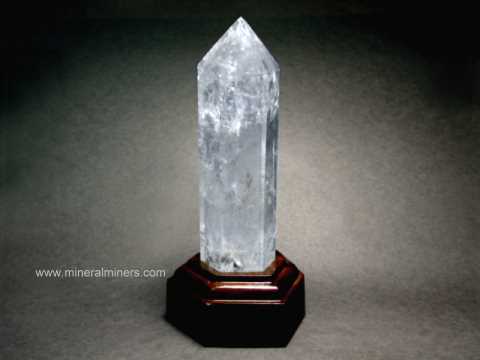 stands up 14" tall x 5.9" x 4.8"
This polished elestial quartz crystal weighs 20.2 pounds, and it stands up 14 inches tall as shown. It was polished from a natural elestial quartz crystal mined in Minas Gerais, Brazil. This beautiful crystal is transparent enough throughout its length that you can just see your hand on the opposite side of the crystal when looking through it. It has increasing transparency toward the tip. 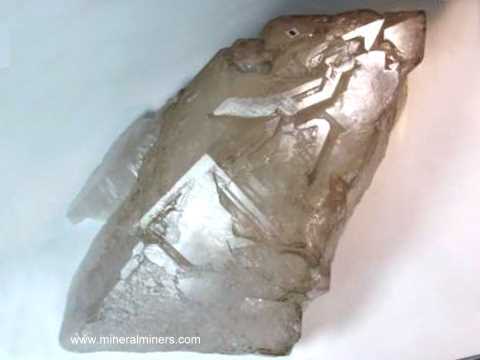 See also a side view photo of this wonderful elestial quartz crystal. Smoky Quartz Crystal Dimensions: 5.6" tall x 4.3" x 4.0"
This rare quality polished crystal of natural color smoky quartz has very fine transparency with medium-dark brown natural color. 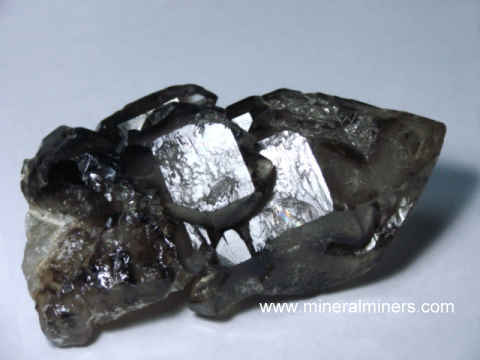 See also another view of this very fine smoky quartz crystal. 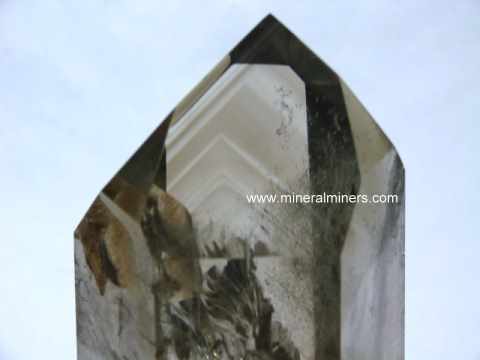 This is the end of our Elestial Quartz Spectacular Items page. Would you like us to inform you when we add more natural elestial quartz crystals on this page? We literally have tons of rare quality elestial quartz crystals in stock at our mineral warehouses, so be sure to let us know if you have any special requests.